BYD’s zero-emissions electric buses provide a range of over 155 miles on a single charge. 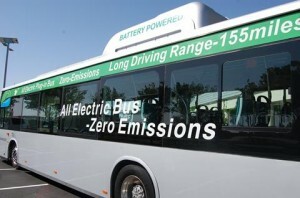 LANCASTER – The Antelope Valley Transit Authority (AVTA) on Monday announced the purchase of two 40-foot, battery-electric buses as part of its clean bus initiative. The buses were funded through a grant arranged by Los Angeles County Supervisor Michael Antonovich to support an electric bus demonstration project in the Antelope Valley. The $1.9 million grant came from Proposition A local return funds and will cover the cost of both buses plus the charging system. AVTA serves a population of more than 450,000 residents in the cities of Lancaster, and Palmdale as well as the unincorporated portions of northern Los Angeles County. Its total service area covers 1,200 square miles and it is bounded by the Kern County line to the north, the San Bernardino County line to the east, the Angeles National Forest to the south and Interstate 5 to the west.